While you are sleeping, you dream of your favorite pieces of sushi floating by your fingertips waiting to get picked to fill your mouth with the freshest flavor, wake up, because it is not a dream anymore. 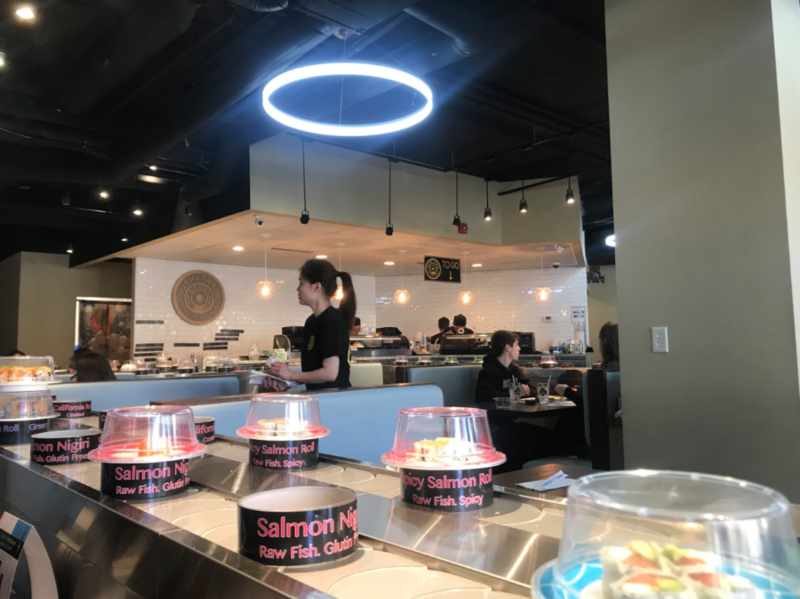 On June 1st 2018, Kevin Ni and three other partners opened Minnesota’s first sushi conveyor belt. On the corner of Nicollet and 12th, guests are seated around a revolving “train” full of appetizers and entrees. When the ingredients are imported straight from Japan, you know it will not be a disappointment. The conveyor belt carries many different items for diners such as; classic and specialty rolls, seaweed and squid salads etc, sashimi and nigiri and even a kid friendly PB&J roll. However, diners are also seated with a full service menu. Guests can order appetizers, full specificity rolls, udon, ramen, and even dessert. The conveyor belt is priced in a very unique way. Each plate is color coordinated to a specific price. Five different colors with each a different price will cruise through each diners mind before picking the perfect plate. Being the sushi fanatic I am, I tried them all. The lowest price is $1.95 which is symbolized by a green plate. I grabbed two avocado rolls, edamame, and the PB&J roll for comic relief. The avocado was fresh and clear of any aging. The rice was wrapped tightly and made for the perfect 1st round. The edamame was a nice palate cleanser as I moved onto my next plate. A simple tuna roll caught my eye and I knew it was my next target. Weighing in at $3.50 it was no disappointment. The tuna was soft and at the perfect melting temperature. It was very important for me to experience that taste again so it led me to my next choice. I grabbed the tuna nigiri as if I was in a race. $4.25 later and I could have cared less I dowsted it in low sodium soy sauce and it was exactly what I expected; perfection. By this point I was starting to get full but with a constant revolving belt of sushi I could not be stopped. My first specialty roll had to be special. It had to be golden. I looked to my left and there it was. The golden mountain roll. This roll was composed of spicy tuna, crab, cucumber, avocado wrapped in yellow soy paper topped with spicy mayo and eel sauce. Weighing in at a whopping $5.50 I knew it was top notch. The spicy tuna gave the roll the perfect kick. The avocado surprised me by adding the perfect texture and the spicy mayo with a complimenting eel sauce was the cherry on top. The golden mountain definitely lived up to its name. At the end of my meal and experience at sushi train I decided to go on a lim and try something new. I had heard so much about baby octopus so I thought why not. At $4.25 I grabbed the plate and ate the dish. To my surprised, I enjoyed it very much. It is an acquired taste but I 100% recommend going out of your comfort zone because you never know the flavors you could be missing out on. Paying no more than $25 for five different menu items the Sushi Train was a steal. I enjoyed all of the food and was very satisfied with the portions. The conveyor belt made it very easy to decide what you wanted next. Overall, I rate the food a seven out of ten. The remaining three points was due to temperature. I would have liked the sushi to have been a little cooler but the flavor made up for it. However, a restaurant is not only rated on food, experience matters. The ambiance of the restaurant was very laid back and cool. As a diner you were not held to any expectations other than to enjoy the food. The service was also very good. Although the customer usually takes the reins when it comes to the conveyor belt, the staff made sure we as guests were satisfied. As a diner I felt like I was in good hands. The restaurant is located in the heart of Minneapolis but still has very easy and accessible street parking. In the end the conveyor belt was truly the highlight of my Sushi Train experience. The new technology allows a playful yet casual participation for a great meal. Overall, I give Sushi Train three and a half stars. I highly recommend this restaurant for a casual, cheap, but quality meal.